Main Board with transparent Polycarbonate slot at the bottom. 2 x Supports, that can be filled with water for ballast (70 litres each) or fixed to the ground. Whiteboard (700 mm x 500 mm) Marker and eraser included. Ear plug dispenser (Plugs not included). Eye Wash Station. 6 x Transparent Document Protective A4 size pocket. Lens cleaning station. 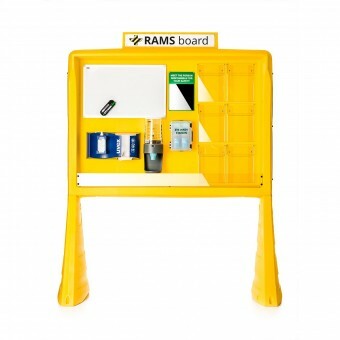 Magnetic Whiteboard (700 mm x 500 mm). “Meet the person responsible for your safety” Mirror . Fixings to join main board and supports and concrete fixings. Dimensions 224 cm x 187 cm x 100 cm (H x W x D). Internal Display Dimension 102 cm x 146 cm x 17 cm (H x W x D). (Please Note - There is a 7-10 working day delivery lead-time on this item).